Your little one has just woken up. She's clean. Her tummy is full. She smells Baby Shampoo fresh. She's smiling that wide–eyed, slightly tipsy baby smile that makes you giggle way down deep. Then she looks up at you with those translucent eyes as the sun catches the glimmer of her ducky–down hair. You just know you have to have this picture for your memories. So you grab your camera without taking your eyes off hers, lift it to your eye, and click! It's just at that instant, she sees some imaginary little something off to the right or left, and she turns her head just BEFORE you get the shot! But it doesn't have to keep happening to you. 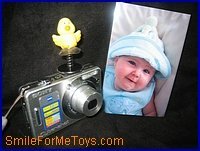 With the help of Smile for Me Toys™, you can take great studio–style photos and cute baby pictures – with your own two hands and the help of a little Birdie! The reason your little one looks away from the camera just as you're about to get your shot is because she doesn't know she's supposed to keep looking at you. She loves to look at your face (and has since birth). But when you move that gray or black camera in front of her favorite face, well, she loses interest. Her eyes and her attention are drawn to the latest interesting thing that floats across her field of vision. Smile for Me Toys™ understands that, so we've designed a simple, fast, so–easy–to–use tool to get her attention at just the right moment. Each Smile for Me Toys™ picture kit comes with a bouncy and bright "birdie" and a simple hook–and–loop, adhesive kit that attaches easily to any camera. 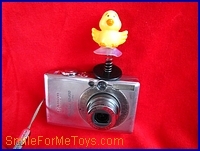 When you're ready to take that "perfect" picture, simply pop the bouncing birdie onto the camera. Your baby girl or boy will zero in on that bright, chirpy figure wobbling happily just above the camera lens. Then all you need to do is click one cute baby picture after another. Order your Smile for Me Toys™ kit today by ordering one today.